Clare spent most of her working life as an interior designer for a vast array of hospitals, retail, law firms, and, for the last 20 years, hotel design and construction documents – a niche where no one else wanted to be. She also taught drawing, design and architecture both at Georgia State University and The Art Institute of Atlanta. 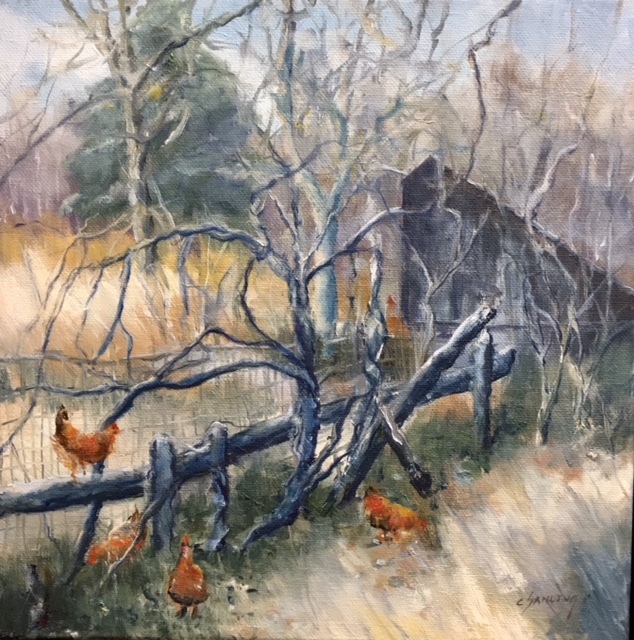 A late bloomer to painting, her first course was at Blue Ridge Community College. Oil painting was not my life’s ambition – I came into it purely by accident. But from painful, drama-queen beginnings, I abandoned a career of 3-D hard edges to experimenting with emotional and atmospheric 2-D art. I have become a representational studio painter and have to say I am evolving and growing every day. I’m a product-oriented person and will probably produce something to the bitter end. I love a garden – especially my own. I’ve drawn much inspiration loving the woods, water, farms, and flowers.